Description of "The Moon's Complexion"
A distant tragedy turns the lives of two strangers upside down when, newly arrived from England, they meet in India and discover a secret that binds them together as they flee from a dangerous stalker. Bangalore, 1991. Ashok Rao, a brilliant young Indian doctor, has returned from England to take part in an arranged marriage. Who is the intriguing Englishwoman that seeks him out there? Journalist Hannah Petersen is being pursued across India by a sinister killer—but why? This exotic tale of love across cultural boundaries unfolds within the mystical heat of Southern India, Sri Lanka and the icy countryside of England in winter. Irene Black was born in England and is based in Surrey. At various times she has been a psychologist and a teacher and has lived in the USA, Australia and India. She has an MA by Independent Study in South Asian Art, specializing in South Indian temples. Her dissertation was on the Hoysala temples of Karnataka. She has won numerous national and international prizes for short stories, poetry and articles, including the 2003 National Association of Writers’ Groups Annual Best Short Story award, and she was shortlisted for the prestigious 2008 Bristol Prize. Her second novel 'Darshan - a journey', about a young anglo-Indian student's fractured identity, is published in UK by Goldenford Publishers Ltd and can be viewed on the Goldenford website as well as the author's own website. 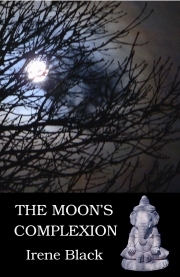 Reviews of "The Moon's Complexion"